One of three recently restored apartments located in a historical Palace that has been in the family for over 200 years. Ideally located on the Grand Canal, you are just a few minutes walk to the Piazza San Marco. Great care and attention to detail was taken into consideration when refurbishing these beautiful apartments keeping the classic Venetian style with an added contemporary twist. 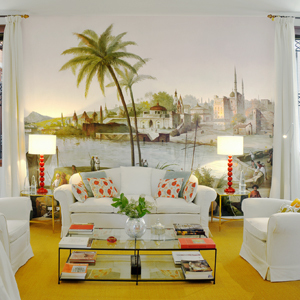 The interior decorator drew her inspiration from the many Venetian frescoes created in the 1600 and 1700's. The rooms are light and airy. No detail was overlooked, from the custom upholstered furniture to the color choices of the lamps, paintings and even the borders of the custom made curtains. The location is ideal, right at the entrance to Venice's Grand Canal, opposite the Punta della Dogana museum and the Basilica of the Santa Maria della Salute. Beautifully furnished with the very best fabrics, furniture and furnishings including the owners antiques passed down through generations. Left from the elevator, two steps down takes you to the front door. Enter onto the spacious living / dining room with French doors leading out to a shared terrace. A staircase from the living room reaches a spacious open living room with casual seating and a third bathroom with open shower. This room has sloping ceilings indicative of Venetian attic roofs. Reached from the Mansarda, a staircase takes you to the roof top terrace where you will have 360 degree views of Venice. Note: Altane are found all over Venice, they are not true terraces, but structures made up of a tray of wooden boards resting on the roof. They rest on small pillars or a side leaning against the loft reached from the attic. Because the small narrow streets that wind around Venice are shaded most of the day, it was a place for Nobles to get some sun and fresh air. Still an ideal place to enjoy an Aperol and soak in the view, watch a sunset or sunrise from here. Elevator, Air Conditioning, Central Heat, Views, Concierge on site - The owner's private secretary is available to assist you anything you need during your stay, including reservations at museums and restaurants, offering a Venetian view on this beautiful city.